Custom Banners & Flags - Order Banners & Flags Online! If you are looking for a custom banner or flag, you are in the right place! We have lots of different products and materials available, so no matter what your signage needs are, we can help you out! If you need something that you don't see listed, feel free to contact our customer service professionals! Vinyl Banners are our most popular product. We offer full-color vinyl banners or less expensive text only vinyl banners. Feather banner flags come in a couple different sizes, with different base options. Rectangle banner flags come in three different sizes, with a couple different base options. Teardrop banner flags come in four different sizes, with a couple different base options. 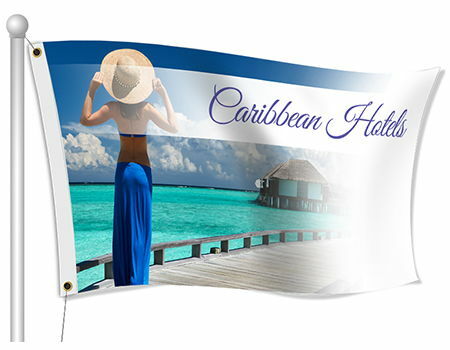 Fabric flags are printed using a direct dye sublimation printing process. This means that the ink goes through the fabric instead of sitting on top of the material.